I have another Christmas card to share with you today. Like the other cards I have been sharing sharing lately, this card also uses the Festive Flurry stamp set and Winter Frost Specialty Designer Series Paper. I used the Circle Card Thinlit Die for the base of this card. I made it with an extra flap by putting the end over top of the die. The snowflakes are quickly cut out with the coordinating Festive Flurry Framelit Dies. 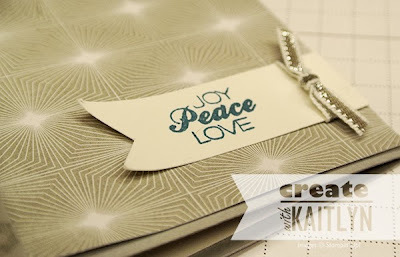 The sentiment is from the Christmas Tagables Photopolymer stamp set. I have said it before, but this stamp set has a ton of great Christmas sentiments. A little bit of Silver Ribbon was the finishing touch to this card.